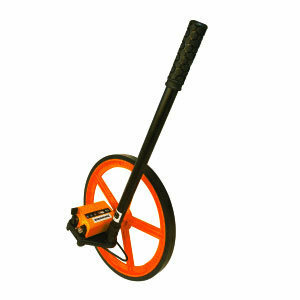 A Surveyor’s Wheel or a Trundle Wheel, is a device for measuring distance. Each revolution of the wheel measures a specific distance and a manual Surveyor’s Wheel is usually marked in fractional increments of a revolution that helps the user translate partial revolutions to actual length measurements for a final total. This tool is usually not too accurate as wheel slippage on sandy areas could lead to inaccurate measurements, but is very helpful when surveying boundaries that are not straight, where a standard tape measure would be useless. In the business of land surveying, a lot of conversion between units of land such as grounds to acres to hectares to cents may need to be done and it is important that the measurement tools support this. With a reed switch mounted inside the controller, and a ring magnet mounted on the shaft of the Surveyor’s Wheel, the pulses generated are decoded by the controller. A unit change button displays the actual length in the desired unit such as meters, feet or other.